It’s always a treat to try some famous high-end restaurants when you travel. I’ll admit to not always taking the opportunity to do this and of course “famous” can mean a lot of different things. When I say “famous” I mean restaurants that are run by well-known local chefs who usually I’ve never heard of. Famous can also mean that the locals eat here and absolutely rave about it. In Portugal, I had the opportunity to try the four best restaurants in Lisbon. They are definitely worth knowing about. I’ll also offer my favorite of all the gelato places! Do you enjoy ceviche? If so, A Cevicheria in the Principe Real area of Lisbon is a must. I spent quite a bit of time both in Principe Real as well as walking through the area to get to other neighborhoods, so I passed this place a few times and didn’t realize what it was. The menu is dedicated to South American cuisine, especially Peruvian tapas and Ceviche. It’s the creation of Portuguese Chef Kiko Martins. It’s a small space and I was told because they don’t take reservations that its popularity means LONG lines at all times. I decided this fact called for a creative solution so I decided to skip breakfast one morning and head to A Cevicheria to get there right when they opened. This worked perfectly and we were immediately seated at the ceviche bar. If you can, though they do have a few small tables, I’d suggest sitting at the bar. You’re in on all the action! I loved watching the staff work. But don’t forget to look up because a huge foam octopus hangs from the ceiling. I took this creative design feature to mean that there would be a creative fun energy brought to the food as well, and I was right. A Cevicheria opened in 2014. Its menu is not solely ceviche, even though you might think so. Chef Kiko does use Peru and ceviche as his starting point and then expands from there. I could describe the food to you but it won’t do it justice. You have to try this place for yourself. I’d also suggest going with others as the food really is meant to be shared. The “pure” ceviche was my favorite of the bunch with fish in lime juice. According to Chef Kiko, his interpretation of the original dish is the closest to what you’d get in Peru. The menu also includes quinotos which is quinoa cooked like a risotto. They serve one with octopus, ham and peas, and another “sea quinoto”, which was amazing with algae, mussels, shrimp, fish and an oyster and algae foam. The tuna ceviche in coconut and lemon grass was perfect. We did not try the pisco sour or the desserts, but from what I could see, they were very popular too. You might be wondering about the prices. It’s hard to say because it really depends on the exchange rate. Three dishes are plenty for two. The price range is around 15USD per dish. The service was great, and no matter how long the waiting line, we never felt rushed. Definitely a place I’d go back to again and again. Sticking with the seafood theme, there’s a restaurant that Anthony Bourdain enjoyed and is now where all the tourists flock, but I was told to avoid the crowds and try Restaurante Sete Mares. It was a long but lovely walk from the Sheraton Lisboa, though easily reached by the metro. This place is a great find. Seafood, galore. It’s not a fancy place. Prices are very reasonable. My Portuguese is limited, to say the least, and our waiter spoke very little English. The menu was huge. At times like this, you just have to take a risk so I pointed to a dish on the menu that sounded good and asked the waiter if it was enough for two. He nodded his head yes, and that was it. What came was Seafood in Cataplana with Monkfish on the Seven Seas. It was gorgeous and almost too pretty to eat. But we ate it all anyway! Delicious. They also have meat on the menu, and I would think they do that well, too. It was a fun place to join locals in a fish-fest. So many different dishes appeared that we could have sat much longer just watching everyone eat. If you feel like venturing off the tourist path, this is a great place to eat. Sintra is deservedly one of Portugal’s greatest tourist towns, though from the conversations I had with locals, it seems everyone enjoys making Sintra a day trip from Lisbon. It’s easy to get there by train and it’s filled with amazing history and castles galore. Knowing I’d be walking up and down hills all day as I explored the scenery and castles, I figured I’d want a nice meal after seeing all the sites. I thought to ask the concierge at my fantastic Sheraton and she told me that one of the Sheraton chefs had a restaurant he liked in Sintra called Taberna Criativa. No clue what made me think to do this but when I got to Sintra before I started my castle explorations, I went to the restaurant and made a reservation for later in the day. Turned out to be a great idea and I’d advise you to do this as well. It was completely booked, so had I not made a reservation, I would have missed a great meal! They have a set menu for lunch with a few different choices. The whole feel of the place was wonderful. Very relaxed ambiance, nicely paced service, and delicious creative food. A glass of wine is included as is dessert. With a main course and a salad, the price came to 12 Euros per person. High quality dining experience at a price that still has me in disbelief. Delicious healthy salad as a starter. Who can resist? Not me. Two Michelin stars are not easy to come by. In 2018, chef Jose Avillez kept his two star designation for Belcanto in Lisbon. His restaurant was the first one in Lisbon to get two stars. Avillez’s other much more casual restaurant, Cantinho do Avillez, is just blocks away from Belcanto and when I checked the menu, it appealed to me more than Belcanto. It features a wonderful menu of hearty Portuguese bistro fare that departs from the Lisbon norm of focusing on fish to include more meat dishes. Do make a reservation because it’s a very popular spot even during lunch time. When I first walked in, the space seemed small and rather noisy, so it was lively and definitely a happening scene. When it was our turn to be seated, we were led outside and into a whole other space which was much bigger and also quieter. Because there was an open kitchen in this area of the restaurant, it was fun to be able to watch the chefs at work. The wait staff was very patient with all my questions about the various dishes, and they were also helpful with wine selections. The whole meal was delicious. The menu changes with the seasons, so the great lamb tagine I had might not be an menu item when you go, but I’m quite certain you’ll find something you’ll rave about. And don’t skip dessert! The hazelnut mousse I had was toooo good. Yummy tuna tartare as a starter. I love a great lamb tagine. One thing that was true about all four of these restaurants was that even though it was obvious we were tourists and might not be back anytime soon, we were treated with warmth and hospitality as if we were regular customers who frequented these places. That’s not always the case at trendy, hugely popular restaurants. Maybe that’s just the Portuguese way, I don’t know. In any case, it made a huge impression on me, enough so that it made me want to share these four special restaurants and declare them the best restaurants in Lisbon! Oh yeah, I promised you a gelato recommendation too, didn’t I? Though Gelados Santini is the place you’ll hear about most often because it’s been in Lisbon since 1949, I prefer Nannarella. Located in a small shop near the Parliament Building, Nannarella Geladeria is excellent! Owned by two Italians, Costanza and Filippo, it remains a bit of a secret because it’s not easy to find. They use Portuguese ingredients, such as local fruits, port, and ginja from Óbidos. Nannarella changes their menu on a daily basis and have three different types of ice cream: gelati, sorbet, and special. Even if you have to go out of your way to find Nannarella, it’s worth it. The shop is small, so take your gelato across the street where there are benches. Sit, eat your gelato slowly, and enjoy! I’m also VERY partial to the pastries and coffee in Lisbon. So much good food to eat in Portugal; there’s never enough time! Eating is one of the top highlights of traveling to places such as Portugal! 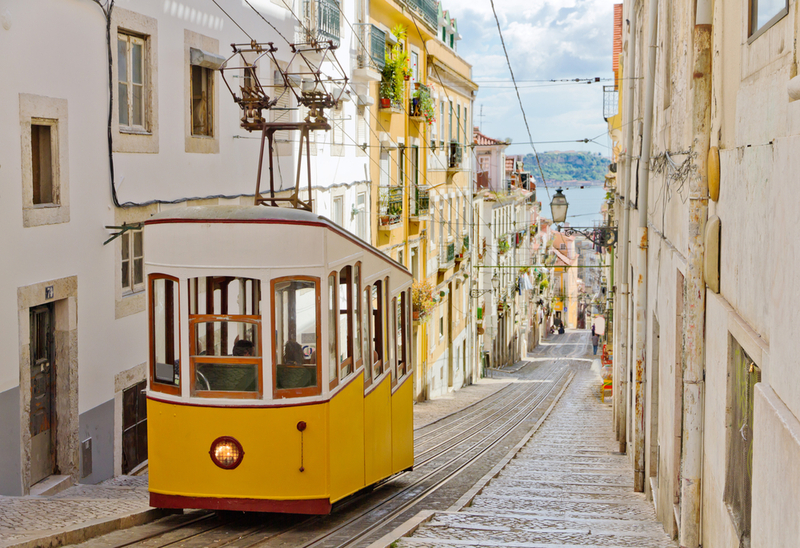 These four best restaurants in Lisbon are excellent. If you have any memorable Portugal restaurant experiences you’d like to add to this list, let me know. And if you’ve been to the ones I’ve mentioned, did you enjoy them as much as I did? Thanks. Nice reviews. I’ll be checking out at least a couple of these — or maybe all! I’m missing Portugal and these restaurants! Enjoy them and thanks for reading, EFF!